After a LOT of time and effort, he uses the pronoun “you” correctly most of the time now, meaning referring to the person he’s speaking to and not to himself. “Iss me sick?” (he had to stay home from school a couple of days this week as he was running a fever, he’s feeling better now). However he decides to word things, I remain infinitely grateful that he is (mostly) willing and able to communicate with us. It means the world to have some insight into what he’s thinking (even though sometimes he still leaves us guessing). He often likes to ask questions that we think he already knows the answer to. Maybe he likes the reassurance of hearing the answers again, maybe he’s just making conversation. For example, he drives his brothers crazy asking things like “do you wike Pokemon?”, “wha’ss you fay-brit cuh-wer? Iss wed you fay-brit cuh-wer?” or “do you wike Kirby-right-back-at-YA?” (a cartoon that apparently went off the air years ago but still lives on YouTube). If he deems the answer “unacceptable” he can be very persistent (ie. when Cuddlebug tried to tell him he doesn’t have a favorite color). That can lead to some funny conversations, like Cuddlebug making up random names for colors that don’t exist because he refuses to just pick a color and Bitty refuses to stop asking until he gets a satisfactory answer. Bitty still tends to ignore us at times, and it can take a LOT of effort and repetition to get any kind of response when we are trying to ask him something or initiate a conversation with him. Or (gasp!) trying to get him to do something. I’m a mom of three boys on the autism spectrum — 11-yr-old id twins and their 7-yr-old little brother — and wife to my dh of 19 yrs who is a SAHD. 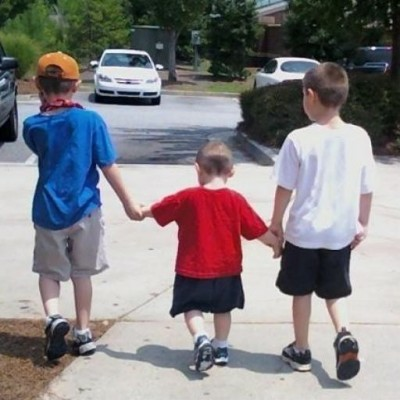 My blog is where I share our story, as well as topics relating to autism awareness & acceptance, twins, the silliness three little boys can get into, and whatever else is on my mind. Hopefully some of what we’ve learned over the years is helpful to others (or at least entertaining). Oh isn’t it so wonderful when they start to talk and you can have conversations (no matter how brief).